This story from CNN Money from last week – April 20th 2015. Just (Click On) the graphic below to watch the CNN video on this story. Less Competition: In 2005 there were 9 major U.S. Airlines…10 years later there are only 5…due to Airline mergers and acquisitions. 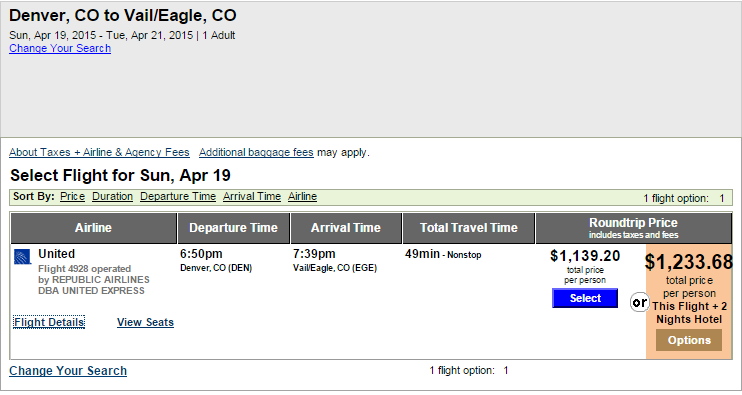 From last week’s ECT – just because an Airlines agrees to accept a Taxpayer Subsidy…it does not mean it will translate into more a affordable ticket prices for flying into our Eagle County Regional Airport. Here is your proof. Bottom Line: When the Airlines (recently ) saved ~$3.4 Billion due to a (33% drop in the price they paid for Fuel)…your average Airline ticket price saved $0.66 cents per ticket. (Click On) the graphic below…to watch the CNN video on this topic. « Hare Today – More Snow Tomorrow?